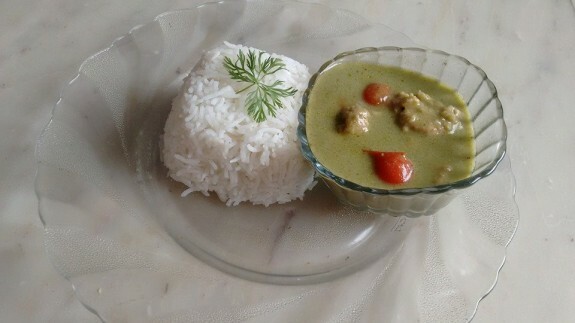 Thai Green Curry Chicken is made as per the traditional ways of cooking in Thailand. A country famous for its curries, you can easily impress your family and friends with this creamy and fragrant green curry. 1. Place all the green curry ingredients in a food processor and process to a paste. Keep it aside. 2. Prepare lime leaves by tearing the leaf away from the stem. Cut the leaves into thin strips. Set aside. 3. Heat a large pan and add oil into it. Add green curry paste and stir-fry it to release the fragrance (30 secs to 1 min). Add coconut milk (keep 1 tbsp coconut milk aside) and stir it. 4. Now add chicken and mix it well. 5. When the curry sauce comes to boil, reduce the heat to medium low for nice simmer. Cook it for 5-10 minutes until chicken become soft. In between, stir the curry occasionally. 6. Add the vegetables lime zest or strips of lime leaf and mix it well. Simmer until all the vegetables cooked properly. 7. Check the taste and if it is not flavourful or salty, then add 1-2 Tbsp fish sauce. Add little more sugar (if you want sweeter curry) and little lemon juice. If it is too spicy you can add more coconut milk too. This is the recipe where the curry should be balanced with spice, salt, sweet and sour. 8. Garnish it with basil leaves on top and serve it with rice.